The Transportation Intermediaries Association (TIA) rebranded its members-only monthly publication, 3PL Perspectives, and the inaugural issue featured an article by LocationSmart CEO Mario Proietti. 3PL Perspectives debuted this April at TIA’s flagship event, TIA Capital Ideas Conference & Expedition, in Palm Desert, CA which is one of the largest meetings for third-party logistics providers in North America. 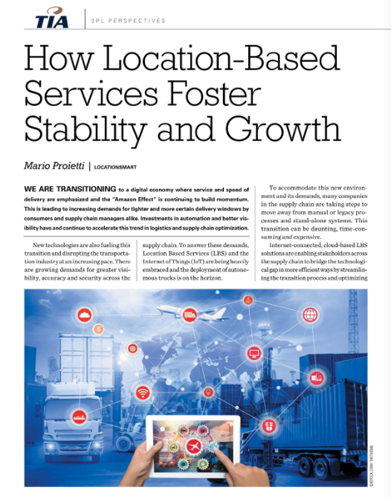 Mario’s article titled “How Location-Based Services Foster Stability and Growth” examines how 3PLs and supply chain partners can leverage location-based services (LBS) and location insights to streamline the transition process away from legacy systems, attain greater efficiencies, adopt new technologies and more. The article reviews a variety of real-life use cases in which LBS and location insights are utilized to achieve systemwide visibility, optimize dispatch activities, elevate customer service and embrace automation and the Internet of Things (IoT). Click the URL below to read the full article.